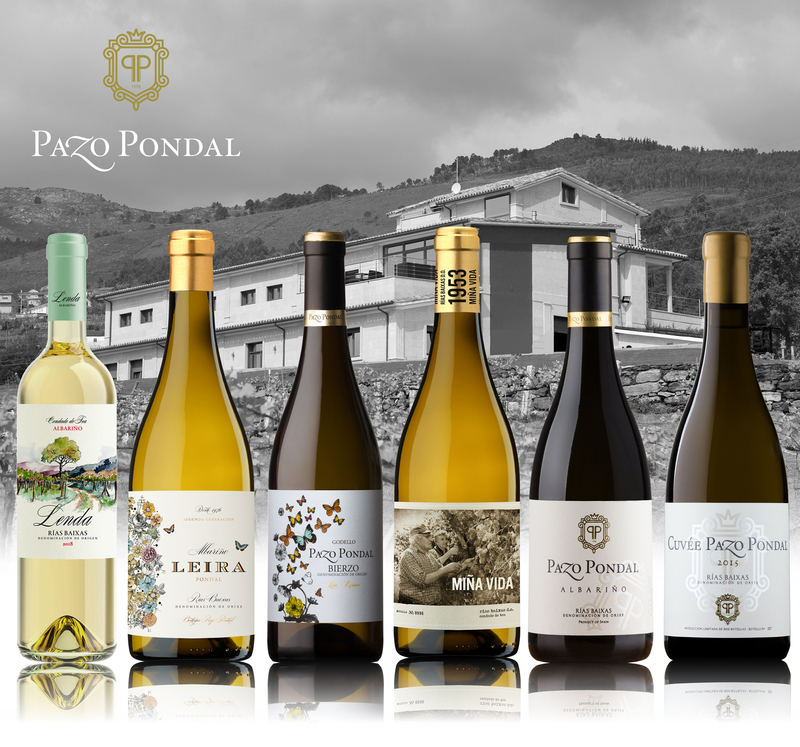 Despite being a region characterized by small farms on small plots, Pazo Pondal has established thirteen hectares of Albariño trellised vineyards on a single estate. This situation facilitates our ongoing transition to organic viticulture, making us one of the few wineries in this Geographical Indication (GI) dedicated to organic growing. Our vineyards enjoy an excellent position in a valley protected by high mountains, creating a unique microclimate that protects the vineyards from sudden changes in temperature. Being in the warmest area of the denomination of origin allows us to produce wines that are more structured and have a higher alcohol content. The striking mountains of pine, eucalyptus and oaks that surround and grow in our vineyards influence the nature, character and distinct qualities of our wines, giving them a unique personality. The vines are grown on trellises, and through this system the vineyard achieves greater aeration and sun exposure, ensuring reduced moisture and lowering the risk of pests and diseases. Likewise, it facilitates the application of treatments as well as pruning and harvesting tasks. Our vineyards enjoy an excellent position, creating a unique microclimate that protects them from sudden changes in temperature. The planting density on our estates is 1.000 vines per hectare. Our vines low yields enable us to capture the very essence of the Albariño grape. The Albariño grape is the star of the Rías Baixas D.O. and is one of the most important and best known grapes in Galicia. Its clusters and berries are small (not exceeding 125 grams) and mature early. It is a sweet, glycerine grape with high sugar and acidity that gives the wines lovely freshness. Traditionally cultivated on a trellis, it is one of the classic symbols of Galicia. However, the D.O. also includes other varieties, both white and red. The Treixadura, Caiño Blanco and Loureira varieties are among the main whites. The Albariño shows itself to be smooth and compact on the palate, with a superlative balance between alcohol and acidity, making the wine particularly pleasant. Everything is coated in a delicious, glycerine-like texture, leading to a velvety sensation, which is still fresh and shows a great variety of nuances, ideal with the local seafood dishes. The climate of the Rías Baixas D.O. is influenced by the Atlantic with mild temperatures and high rainfall that decrease considerably in the summer. The average winter temperature is around 10°C, and there is only a small difference between day and night time temperatures. Rainfall is around 1200ml. on average each year. Located in the southwest of Galicia, the RÍas Baixas D.O. came to prominence for the first time in 1980 thanks to the region’s star grape, the Albariño, the Galician grape par excellence, representative of the very finest of Spanish varietals and the one with the most personality. Our wines are the definitive product of the Albariño grape, one of the best and most versatile white grape varieties in the world.